The following are liner notes that first appeared on the 1979 vinyl album release The Decca Tapes. The complete behind-the-scenes story about the “alternate history” presented in these notes is available at this link. For those of us in the United States, the Beatles burst upon the scene as an overnight phenomenon on The Ed Sullivan Show of February 9, 1964, but years of hard work and “paying dues” in small clubs in England and Germany preceded this so-called “overnight” success. Even though, in the first blush of Beatlemania, most of the group’s early recorded work was quickly issued in the U.S., it has taken more than fifteen years of legal wrangling to fill, for American Beatle fans, an important “fifteen track gap” : the so-called Decca Tapes. By late 1961, the original Beatles (John Lennon, Paul McCartney, George Harrison, and Pete Best on drums) had been playing together as a foursome for over a year, chiefly at beat clubs in the Liverpool area, but also in the steamy hot spots of Hamburg, Germany’s notorious port town. In May of 1961, while in Germany, they recorded a few songs for Polydor as a backup band for English singer Tony Sheridan, but both the single and EP that came out of the session faired poorly. Still, local Liverpool interest in the import single – My Bonnie/The Saints (German Polydor 24-673) – caused record store manager Brian Epstein to look the group up and, liking what he saw, to become their manager. As his first task, Epstein set about securing the Beatles an English recording contract. The group had a few strikes against it, at least in the eyes of the London-based record company executives. For one thing, the Beatles were essentially a loose, raw bar band that dressed sloppily and fooled around on stage. They violated the industry ideal of very clean cut, professional performers such as Bobby Vee in America and the Shadows in Britain. As a foursome, the Beatles had to fight against the feeling then prevailing in the English music industry that “groups were on the way out” in favor of solo crooners. What’s more, the Beatles were from Liverpool, a Northern seaport town looked down upon by those in the South. So, it was a major victory, not only for the Beatles, for all of Liverpool’s “Merseyside” when Epstein convinced Mike Smith, a record producer for Decca (one of the London majors), to give the Beatles a tryout on the afternoon of January 1, 1962. Epstein had already begun to “tame” the group, but their wild stage presence showed through at the audition and that excited Smith, who envisioned the Beatles as some sort of rock version of the Goon Show comedy troupe. Figured he had an off-beat novelty item, Smith quickly signed the Beatles to a five single contract and planned to begin recording as soon as possible. News of their rapid signing prompted the British branch of Polydor to release its own pressing of the group’s record backing Tony Sheridan – My Bonnie/The Saints (Polydor NH 66-833) – on January 5th, in the hope of cashing in on the new stature of the Beatles. To combat the Polydor record, a recording session was called for January 9th, just over a week after the Beatles had first walked into the Decca offices. The group’s first Decca single – Three Cool Cats/Hello Little Girl (Decca F 11339) – was rush released on January 19th. The A side was a humorous version of the Coasters’ 1959 hit Three Cool Cats, a jivy streetwise epic of cruising for “checks.” Lead guitarist George Harrison was in the lead vocal slot, which demonstrated the much more up front position he then held, compared to his later sublimation to John and Paul. George’s singing was great, but the song was a bit too loose. The interjections by Paul and especially John (“save one for me”) just weren’t funny, and the sloppy ending ruined what was otherwise a very respectable single. The main problem was that it fell into the nether land between almost funny and almost serious, and radio DJs already confused by the group’s Northern heritage and German backup band roots, simply ignored both the Polydor and the Decca singles. The B side was a Lennon-McCartney composition, Hello Little Girl (a song given to the Fourmost in 1963 once fame had come to the Beatles). It took quite a fight to get an original group composition on either side of the record, because songwriting was then viewed as the exclusive domain of professionals who churned out tunes for eager singers. Even though a Beatle original, Hello Little Girl might as well have been from Tin Pan Alley, for it was super clean with no real life, like much of the Shadows’ material. John and Paul sang a nice duet, but it was awfully hokey and the end was almost embarrassingly formula. When it became clear to Smith that the Polydor and Decca discs had cancelled each other out, he got Decca to dig out two other songs recorded at the January 9th sessions and put them out as an immediate follow up single – The Sheik of Araby/September In The Rain (Decca F 11364) – on February 23rd. Smith’s selection of Sheik as the A side merely compounded the damaged that Three Cool Cats had inflicted. The novelty image just didn’t sell (largely because that’s not what the Beatles were) and it almost proved fatal to their career. The song, a 1922 Broadway melody, was a parody of the Rudolph Valentino craze that followed his role in the 1921 movie The Sheik. It had become a pop standard of the 1920s, was revived in a 1940 flick, appropriately titled Tin Pan Alley, and more recently had been given a rock’n’roll treatment in a mildly successful 1958 disc by Lou Monte for RCA. George was again the lead singer, John did more funny mouth sounds, and the end was again sloppy. Unlike the first single, this was intended to be a total send-up, but almost completely missed the mark. Because Decca didn’t have the foresight to send the Beatles on an extensive cross-Britain tour, the group was still restricted to playing in Merseyside clubs, and they remained completely unknown outside the North. The two Decca singles sold in Liverpool, but nowhere else. They weren’t even reviewed by the major music weeklies. The B side was a remake of Dinah Washington’s 1961 hit, September In The Rain, with Paul as lead vocalist for the first time. In retrospect, his singing displayed some promise, but he never seemed to “let loose.” He came right to the edge a few times, especially near the end, but with orders to “be restrained” probably still on his mind, Paul let the chance for any real feeling slip away. With two certified flops, the Beatles were about to become tagged with a “loser” label. Brian Epstein spent the end of March in long planning sessions with producer Mike Smith, trying to decide where the group should go next. The Beatles themselves wanted to be allowed to record their own compositions, but Decca wouldn’t hear of it, feeling it was too risky, particularly after the group’s poor sales record to that point. Epstein convinced Smith that the stage-oriented novelty angle had to be abandoned in favor of an image as a good rock’n’roll band that covered the rock classics. A recording session was held April 4th, just before the Beatles returned to Hamburg for another extended engagement, and this session resulted in a marked improvement in the group’s sound. The resulting single – Memphis/Love Of The Loved (Decca F 11405) – released on April 20th, finally got the Beatles some radio airplay. The A side brought John Lennon to the forefront for the first time, in an almost slavish copy of Chuck Berry’s original 1959 recording, with the chunky drums of Berry’s version replaced by an excellent bass line. John’s handling of the lyrics, which described a young lover’s lament for his lost six-year-old girl friend, was reverent, with the slight touch of wry humor that Berry did so well. George’s guitar fills were something to notice, though he did flub parts of the solo. A favorable review in Musical Express (“a nice old sound”) resulted in a few spins on the BBC, which probably saved the Beatles from having their contract bought out by Decca. Group pressure resulted in another Lennon-McCartney song on the B side, but, again, it was a safe ballad, Love Of The Loved, featuring acceptable crooning by Paul. The production was almost identical to that used when Paul gave the song to fellow Liverpudlian Cilla Black in 1963. None of these singles were released in the U.S. because at the time even the top British rock acts were ignored by American DJs. However, in an odd move of corporate psychology, Decca bought the American rights to the 1961 Tony Sheridan single of My Bonnie/The Saints and released it in America (America Decca 31382) just as Memphis came out in Britain. The rapid drop of My Bonnie into anonymity in the U.S. precluded any quick return to the American market by Beatle singles. The mild success of Memphis in Britain convinced Brian Epstein and the Beatles that the group had the potential for stardom, but that Decca was handling them all wrong. During May, while the band played in Hamburg’s Star Club, Epstein secretly felt out the other major London record companies, and secured a promise from George Martin at EMI to listen to the group when it returned from Germany in June. Sensing they might have something of value, Decca executives demanded that the Beatles get into the recording studio the very day they returned to England (June 5th) and record material for the fourth and fifth singles. Unbeknownst to Decca, Epstein had already set the very next day (June 6th) as the date for the Beatles’ EMI audition. Still charged with the energy from playing seven hour sets nightly at the Star Club and eagerly anticipating the upcoming EMI tryout, the Beatles laid down six tracks for Decca on June 5th. From this session came their best Decca single – Searchin’/Like Dreamers Do (Decca F 11487) – released ten days later (June 15th). Returning to the Jerry Leiber-Mike Stoller catalogue of Coasters’ songs (Searchin’ was a huge hit for them in 1957), the new A side was everything Three Cool Cats wasn’t. It didn’t try to be funny, but it had a light touch that complemented the great music. George’s guitar solo was still a bit sloppy, but the mix of voices and music was much tighter than before. The big news, however, was Paul’s singing. In his debut as an A side vocalist, Paul fulfilled the promise of September In The Rain. He displayed much more control of his voice than before, toying with it, letting it slide into a Little Richard-ish wail, but then quickly coming back to an Elvis-style throaty snarl. This was a sound to make people sit up and take notice. The song had more life than 90% of what was then on the radio (British or American), and a few enthusiastic reviews and some widespread airplay generated respectable national sales (figures not lost on EMI executives later that summer). The B side, ignored then as all B sides usually were, must be noted. Paul was again singing lead on yet another Lennon-McCartney song, but it was the first to reflect the life and power they brought to cover versions. Like Dreamers Do (given a tamer treatment by the Applejacks in 1964) was quite close in feel to Love Me Do, and the strength of Paul’s voice made the tune come alive (though a hokey ending almost ruined the effort). A group that could not only perform but write material like this was a group that might be able to put some of the electricity back into rock’n’roll! At the EMI audition of June 6th the Beatles showcased their original material, and George Martin, while not overwhelmed, was impressed enough to recommend signing the group once the release of their next single completed their obligation to Decca. It wasn’t until mid-August that the EMI brass, noting the widespread reaction to Searchin’, offered the Beatles a contract. At this point, the story began to get hectic. The Beatles signed with EMI to record for its subsidiary, Parlophone. George Martin agreed to produce them and promised that they would be allowed to record their original compositions. Pete Best was dumped as drummer and Ringo Starr, who, as drummer for Rory Storm’s Hurricanes had occasionally sat in with the Beatles in Germany, took Best’s place. Decca, realizing too late that the group had slipped through its fingers, used two other tracks from the June 5th session for the Beatles’ fifth and final Decca single – Sure To Fall/Money (Decca F 11533) – released on August 17, 1962. The choice of Sure To Fall (a 1956 Carl Perkins tune on Sun records) as the A side might have been made out of spite. While they later recorded some very nice country-flavored material, the Beatles were not ready to do a Dixie-fried tune like this in 1962. Lead singer Paul mocked Perkins’ Southern drawl on “it’s a natural ‘thang’ to do;” George’s slurry guitar solo, while patterned after the original, had none of the bite usually found on Perkins’ tunes; and the background harmonizing by John was flabby in comparison to the Sun version. It may be that, like Polydor back in January, Decca was out to torpedo a group it no longer controlled. Money (a 1959 hit for Barret Strong and one of the first records from the Tamla-Motown complex), the B side, was a much better song, with John singing almost as well as he did on the version recorded for EMI a year later. Like Paul on Searchin’, John finally let himself go. Had it been promoted as the A side, Money could have been a full-fledged hit. Music reviewers, excited by Searchin’, were disappointed in Sure To Fall; sales figures were disappointing as well. Nonetheless, the Beatles began a new phase of their career with optimism. From the first EMI recording session, held September 11th, two Lennon-McCartney originals were chosen for release on October 4th as their debut Parlophone single – Love Me Do/P.S. I Love You (Parlophone R 4949). Backed by a more sympathetic, enthusiastic organization, the Beatles became a world wide sensation in little more than twelve months. 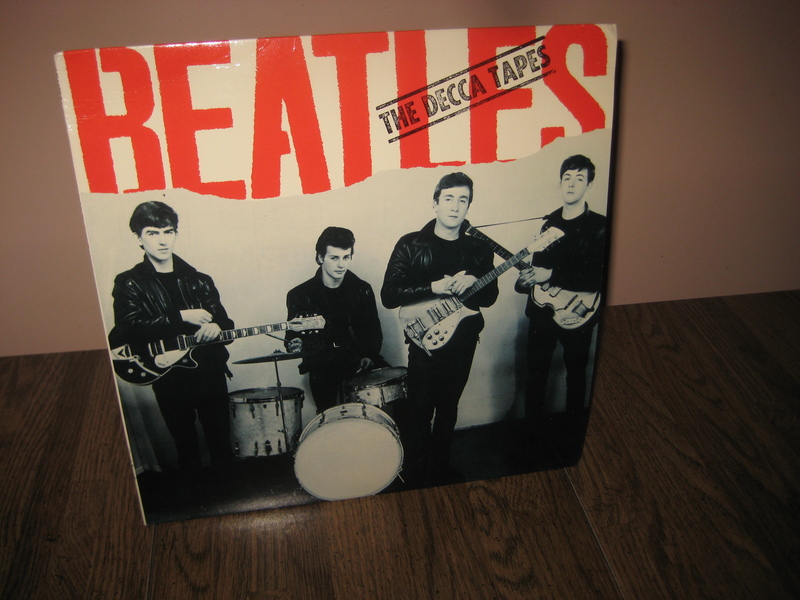 Exactly one week before the release of Love Me Do, Decca, trying to make the best of a bad situation, issued a fourteen track LP, titled The Original Beatles (Decca LK 4437), consisting of the ten tracks from the five singles, plus four cuts left over from the three recording sessions. From the January 9th sessions came Besame Mucho, a 1943 Latin-flavored love song that Jimmy Dorsey’s band made popular, though the influential Coasters had also turned out a rock version in 1960. As done by the Beatles, Paul sang lead in a somewhat sloppy version that was still obviously a lot of fun. In the “novelty” groove, the Beatles bounced through two and a half minutes, with fake steps, “boom chaka booms,” and a crazy rhythm that, while not as tongue-in-cheek as the version the band recorded seven years later in the film Let It Be, still outshone The Sheik of Araby. From April 4th came ’Till There Was You (from the 1957 Broadway hit The Music Man). Paul sounded even prissier than he did on Love of the Loved (also recorded that day). The guitar mistakes made the cut sound like what it was – an outtake (in fact, with all his flubs, it’s hard to believe that George had heard the song very often before that day). The other two cuts, Crying, Waiting, Hoping and To Know Her Is To Love Her came from the long June 5th session. Crying, Waiting, Hoping was a Buddy Holly tune released shortly after his death in 1959. George handled the lead vocals well, sounding a bit like Holly but without the hiccups. His guitar work was better than on most of the other Decca cuts, and it’s clear he truly loved the song. It would have been a much stronger single than Sure To Fall. Phil Spector’s 1958 hit with the Teddy Bears, To Know Him Is To Love Him, was altered to a male singer’s view, but Decca insisted on keeping the original title anyway. John sang lead and, as on Memphis, was very restrained and very clean. It was a polished record, but in the positive sense of the phrase and much in the manner of the original. 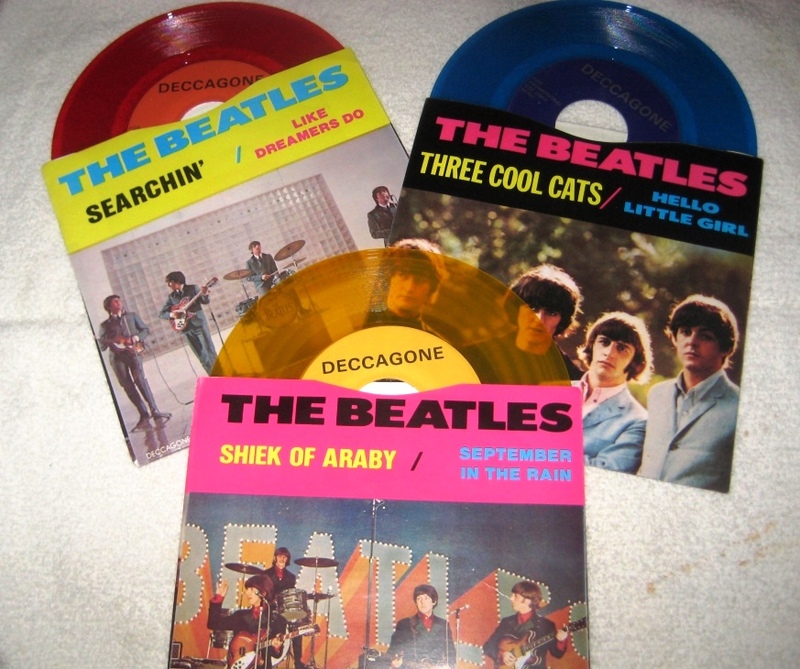 The Beatles were furious at Decca for issuing the album so close to their EMI debut, and for including the four outtakes, which the group claimed Decca had no right to release. The legal entanglements forced Decca to cease production of the album in late October and very few copies made it to the stores. The legal impasse lasted fourteen years, until the end of 1976. More than six years after the group had broken up, all the parties reached an agreement that allowed Decca to rerelease the songs, as long as it was on a special subsidiary label (Deccagone), and as long as the records were issued in “limited edition” pressings, not mass produced as “new product.” Through 1977, 1978, and 1979, the original five singles, plus two others (made up of the four added album tracks) were released in the U.S. and Britain on colored vinyl and with full color picture sleeves. Now, for the first time since 1962, the Beatles’ Decca tracks are available again on one album, plus a special bonus: a Beatle version of Bobby Vee’s 1961 hit Take Good Care Of My Baby (sung by George), which was only recently retrieved from the Decca vaults. The files indicate it was recorded at the Beatles’ Decca audition on January 1, 1962, and it shows very clearly the safe, clean sound the group was, at first, trying to copy on record. Fortunately, they finally rejected this in favor of the tight punchy rock’n’roll they had been playing live on stage for years. After leaving Decca they went on to produce some of the finest and most influential music in rock history. The Decca Tapes package you are holding traces the evolution of this music and is one of the most important “roots” albums of any rock collection. NOTE: “The Untold Story of the Decca Tapes” is a work of historical fiction. The explanation of this fabrication is at this link.